Ο Εθνικός Κήπος είναι ένα ιστορικό πάρκο 154 στρεμμάτων, το μοναδικό που διαθέτει η Ελλάδα. Δημιουργήθηκε τον 19ο αιώνα (1839-1852) και αποτελεί αναπόσπαστο κομμάτι της συλλογής των Ευρωπαϊκών Βασιλικών Κήπων και μοναδικό δείγμα δυτικοευρωπαϊκής κηποτεχνίας του 19ου αιώνα στη Μεσόγειο. Έχει το χαρακτήρα βοτανικού κήπου περιλαμβάνοντας περίπου 500 διαφορετικά είδη καλλωπιστικών δένδρων, θάμνων κλπ πολλά από τα οποία εισήχθησαν για πρώτη φορά και καλλιεργήθηκαν αρχικά στον Κήπο. 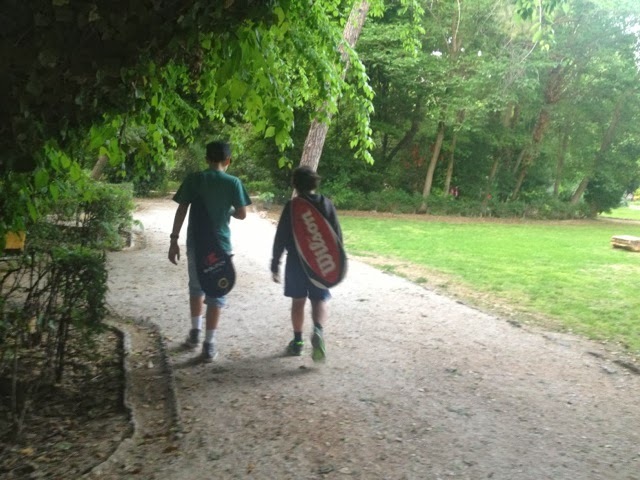 “It remains in my memory like no other park I have known. It is the quintessence of a park, the thing one feels sometimes in looking at a canvas or dreaming of a place one would like to be in and never finds” wrote Henry Miller about the National Garden in 1939. 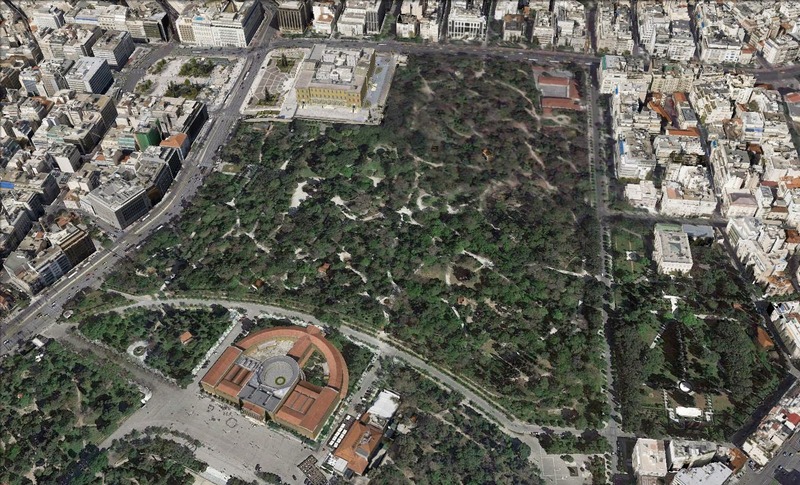 Since then, the image of what used to be the best location in Athens has certainly been altered. 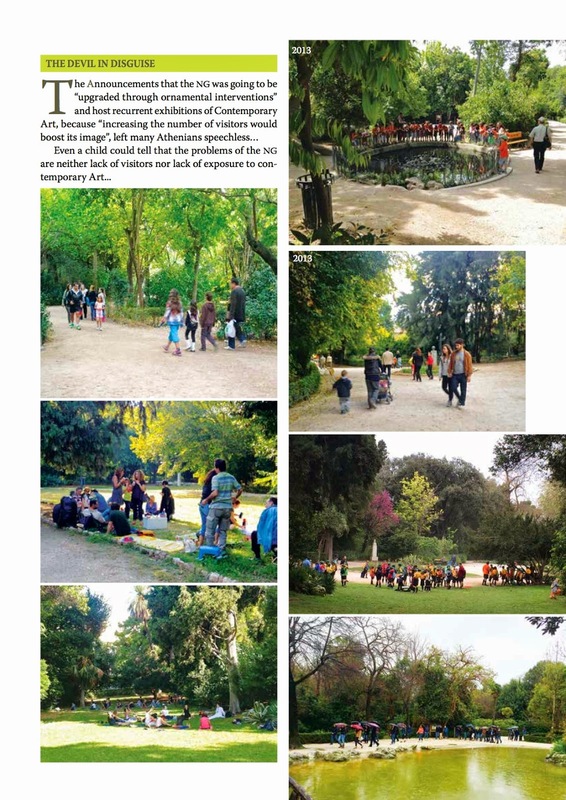 However, a walk through the narrow earth paths of the garden never lost its value or its ability to travel you back to childhood, when feeding the ducks was part of your regular Sunday stroll with grandma. 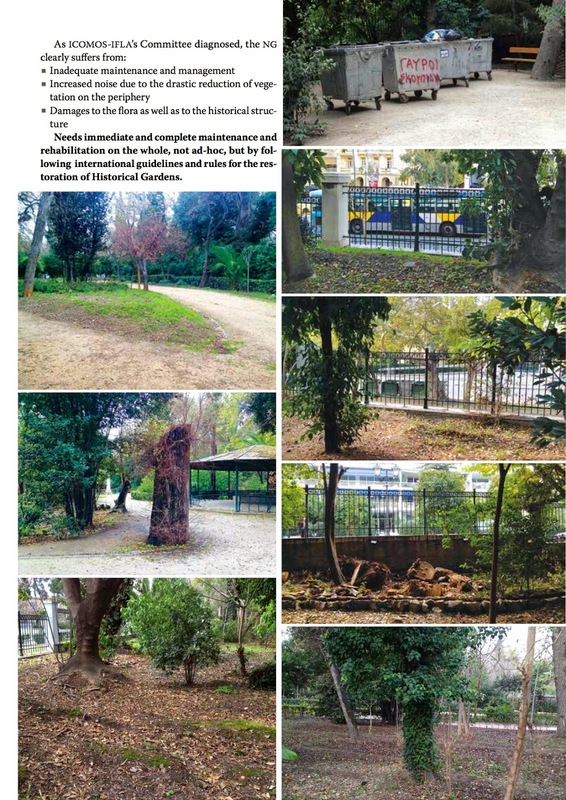 The Garden is seriously neglected – some say on purpose – but the truth is that, while friends of the garden and scientific bodies struggle to save the only green spot in downtown Athens, the Municipality tries hard to privatise it on the excuse that there is not enough money for its preservation. Hot Doc’s research, however, shows the exact opposite. The Royal Garden was created in the 19th century. 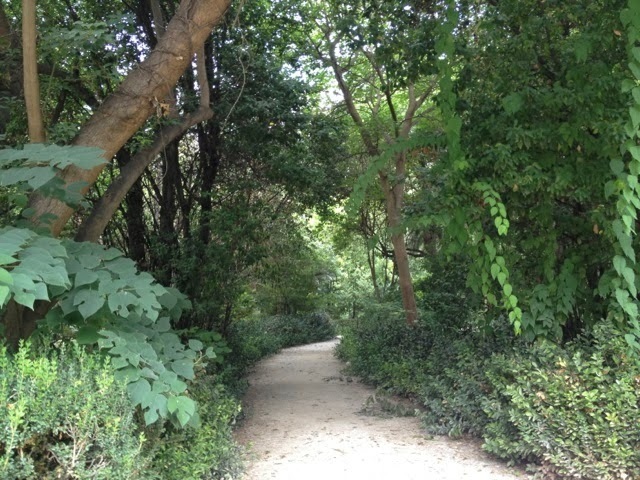 It is a botanical garden with about 500 varieties of ornamental trees, spreading over 154,000 sq.m. 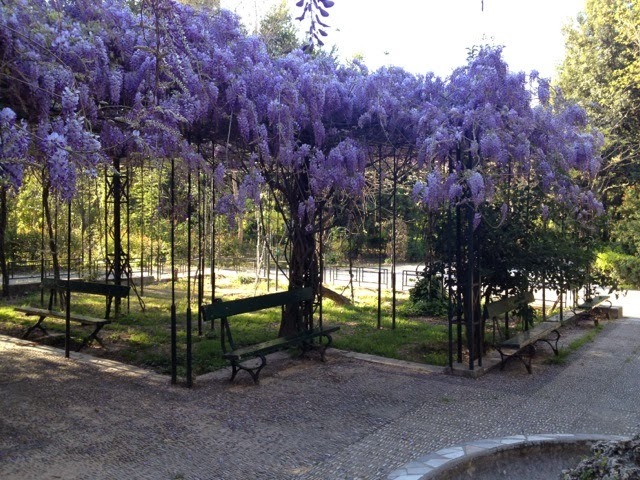 In 1839, 15,000 ornamental plants were brought over from Genoa and planted there. It is said that Queen Amalia was so involved that she spent three hours each day caring for it personally. 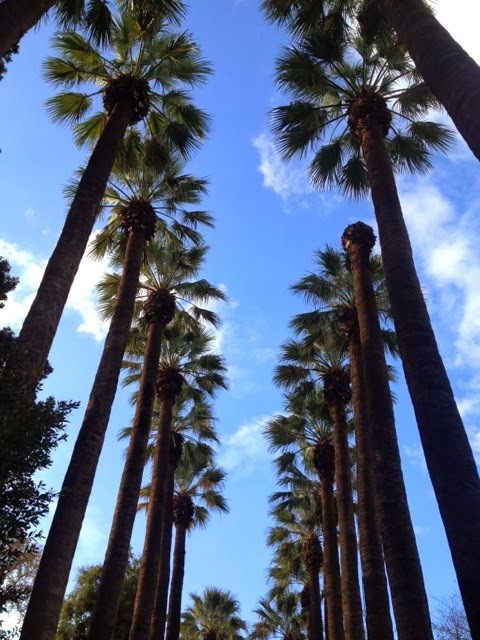 In fact, in 1842, she planted the Washingtonia palms that can still be seen today at the main entrance on Amalias Avenue, with her own hands. The Royal Garden was renamed “National Garden” in 1927 at the transition of the regime to a Republic, and opened its gates to the public everyday day from sunrise to sunset. Friends of the National Garden” was created with the purpose of supporting the Public Body carry out its duties, primarily by providing financial support, which it did whenever required. 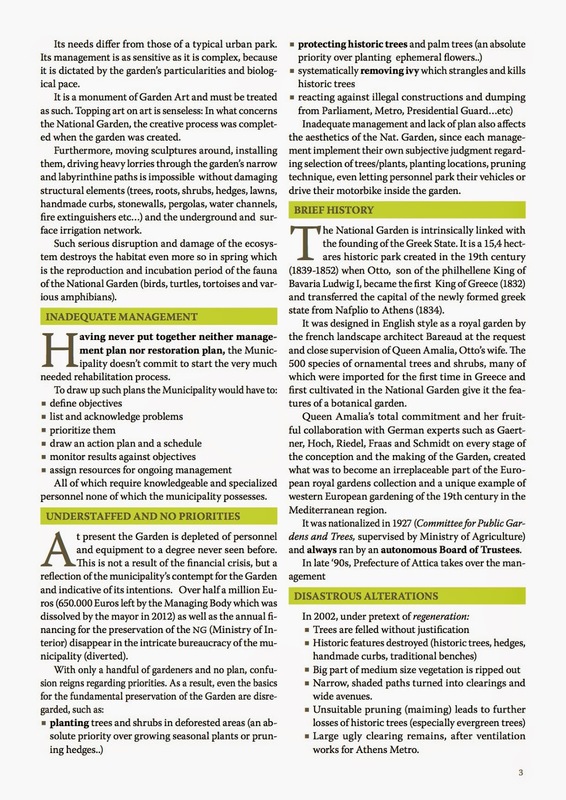 In March 2011, the Board of the Public Body succeeded in having the National Garden characterized as a Historical Site by decree through the Minister of Culture, effectively getting in the way of those planning exploitation of the Garden. It must be stressed here that dissolving the Public Body cannot be justified by financial cuts, given that all members of the specific Board worked on a non- remunerative basis. In place of the independent Public Body, the Municipality set up a non- executive advisory committee. 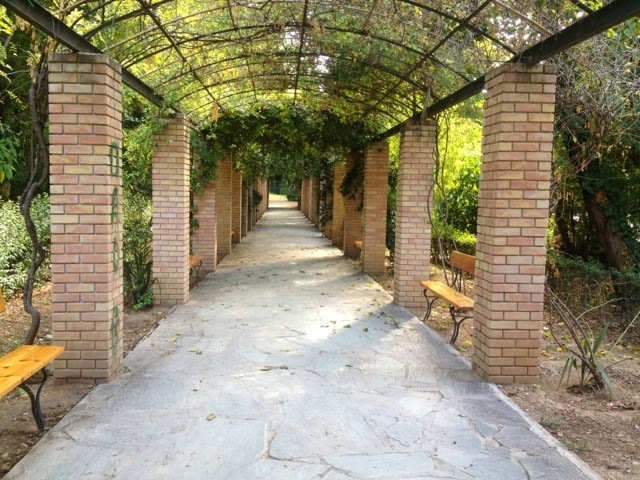 Henceforward, the Directorate of Greenery and Environment of the Municipality undertook the management of the National Garden, in much the same way as it would any public square or any common urban green space. The worst time for the National Garden had begun. Friends of the Garden have numerous sad incidents to report: unskilled gardeners unable to properly care for trees, who would prune in full springtime taking down whole branches with bird nests; Plants are neglected and it seems that the National Garden is another victim of the financial crisis. The already minimal staff is further reduced, which results in any maintenance work being done erratically, if at all. 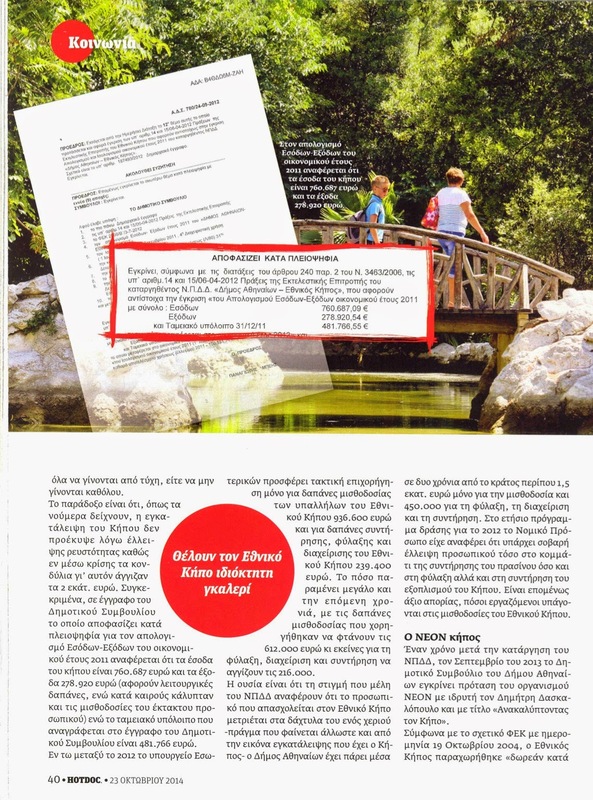 dissolution of the Public Body) the Garden’s income amounted to 760,687 E whereas its expenditure (consisting of operating expenses and occasional payment of seasonal staff) to 278,920 E, while the cash balance according to the same document amounted to 481,766 E.
In 2012, the regular subsidy allocated by the Ministry of Internal Affairs for the National Garden shows 936,600 E just for salaries and 239,400 E for maintenance, security and management cost. The subsidy remains high in 2013 with salaries reaching 612,000 E and maintenance, security and management costs reaching 216,000 E.
IN SUBSTANCE, while according to members of the dissolved Public Body, the staff actually working in the National Garden can be counted on the fingers of one hand – something obvious given its image of neglect – the Municipality has received for a period of merely 2 years, over 1.5 million E just for salary expenses and another 450,000 E for security, management, and maintenance costs. 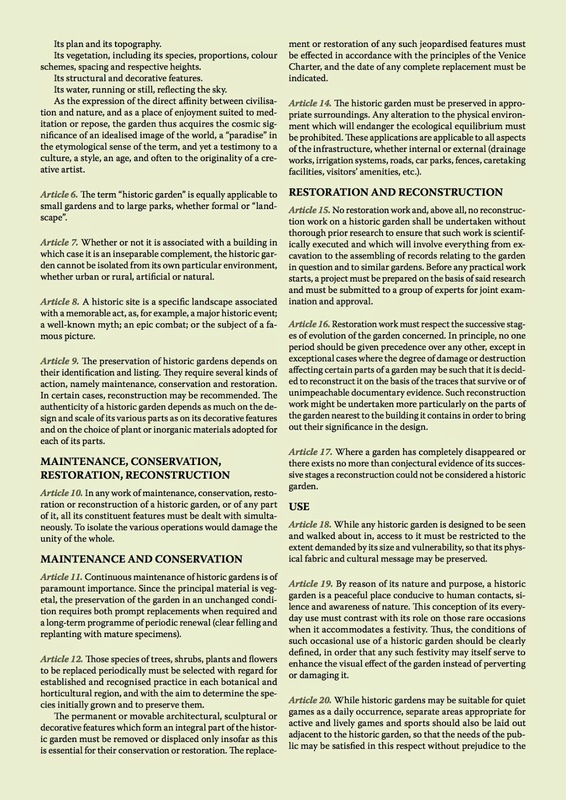 In its Annual action plan for 2012 (the year it was dissolved), the Public Body had reported serious staff shortage, so much in the sector of garden maintenance, as in that of security, and of equipment maintenance. One therefore rightly wonders how many people are actually included in the payroll of the National Garden. 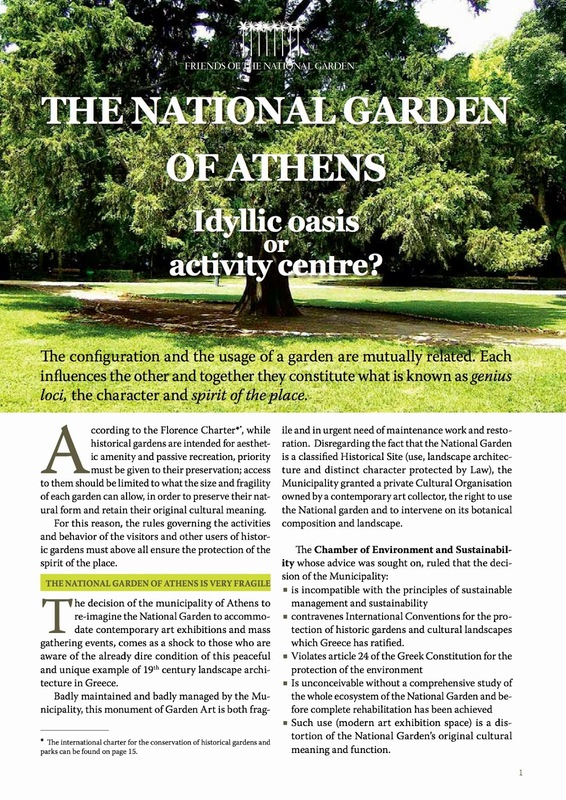 In September 2013, just a year after the dissolution of the Public Body, the City Council approved a proposal by Cultural Organization “NEON” (whose founder is businessman and contemporary art collector Dimitris Daskalopoulos), entitled “Discovering the National Garden”. 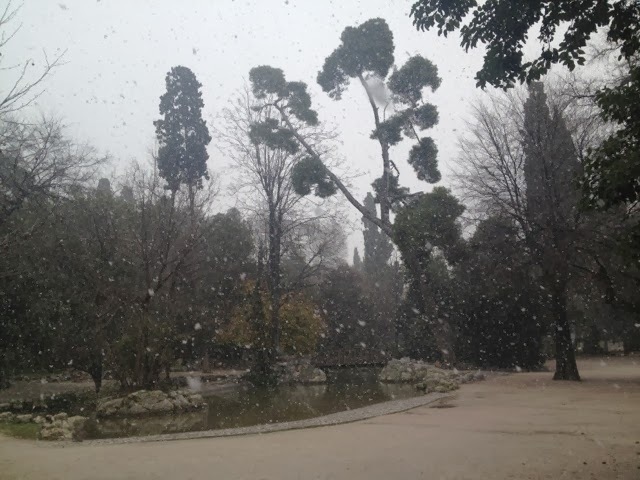 Departements of the Ministry of Culture and all works being subject to approval by the competent agency of the Ministry of Culture and subject to supervision by its representative, on the basis that the National Garden has been classified as an archaeological site. 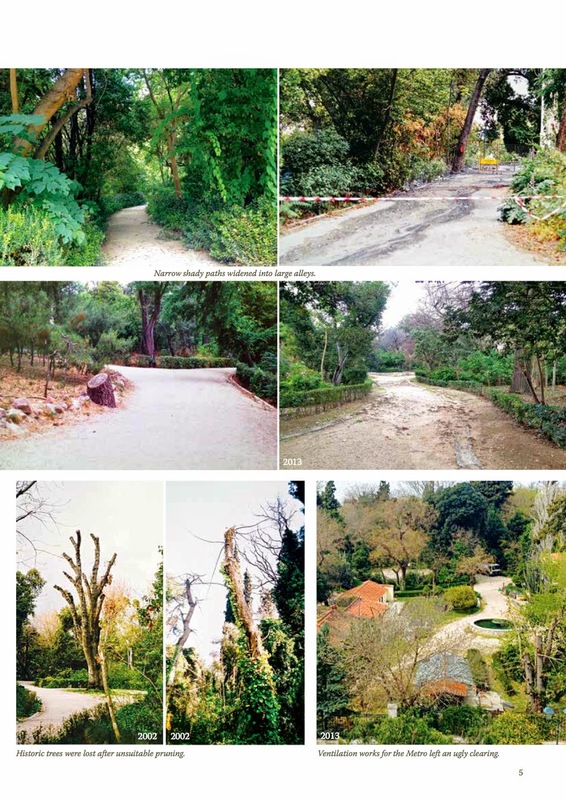 These are the commitments of the City of Athens under the law, as far as the management of the National Garden is concerned. However, following the approval of NEON’s proposal by the City Council (20 votes in favor and 14 against), the Mayor and NEON gave a joint Press conference and presented the latter’s planned interventions. 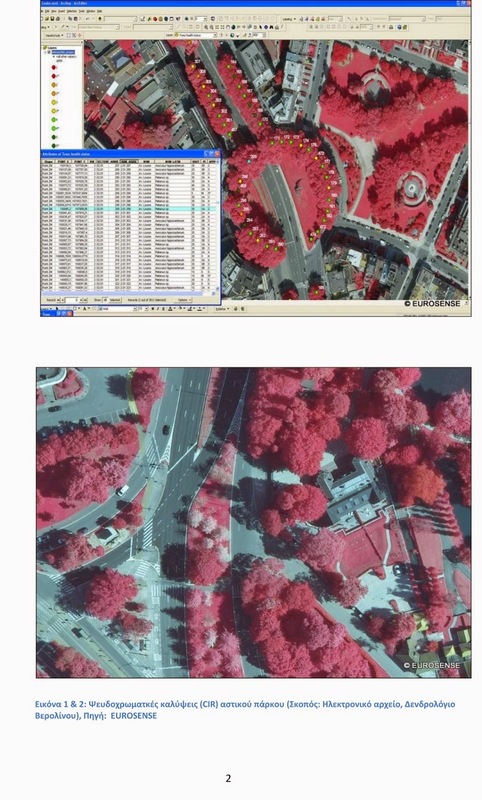 The proposal did not occur within the context of a tender by the Municipality, but at NEON’s own initiative, “for the salvation of the National Garden”. 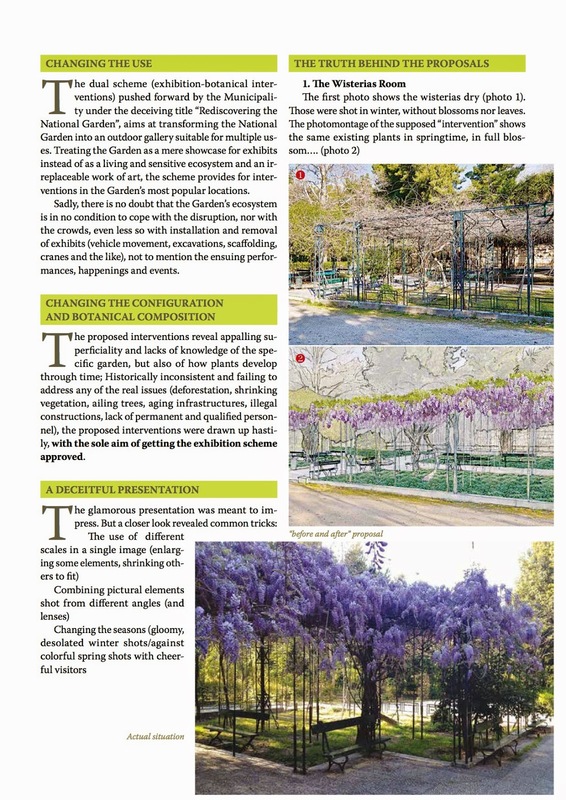 The proposal included botanical interventions in eight parts of the National Garden and a recurrent scheme of contemporary art exhibitions for two months every two years. 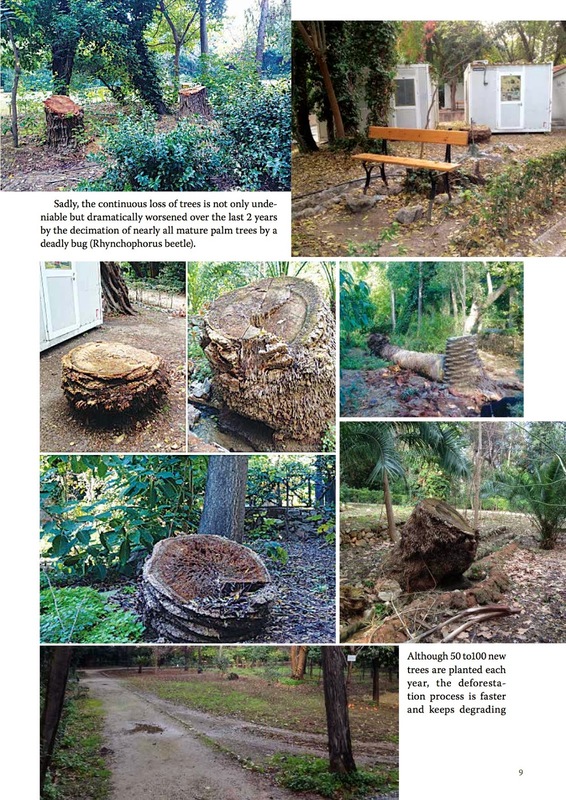 It called for the removal of the historic Washingtonia palms, which the Municipality had the duty to preserve, the removal of self sown trees and a fig tree (significant elements of the landscape at the pond), and the planting of new, alien species in the “Wisteria chamber”. 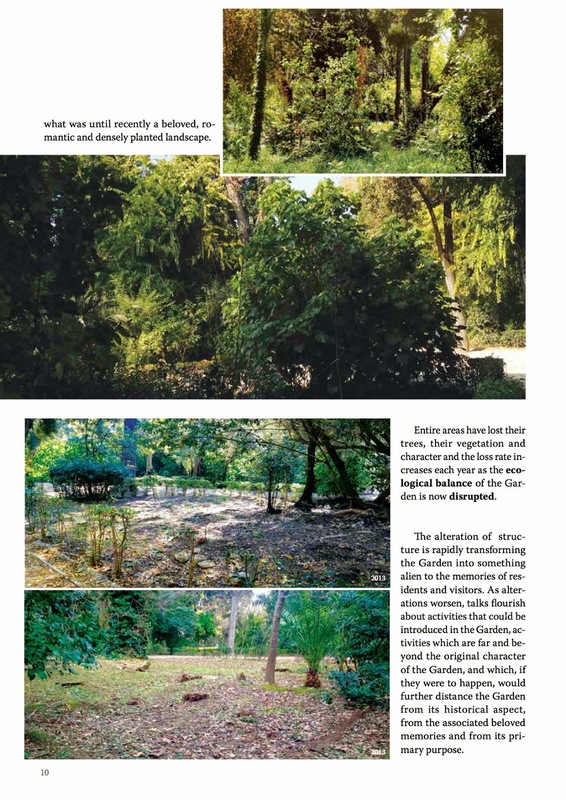 Another major intervention, according to the study, was to “restore” the alleged “visual contact” between the Parthenon and the Garden that had existed in the 1840’ies. 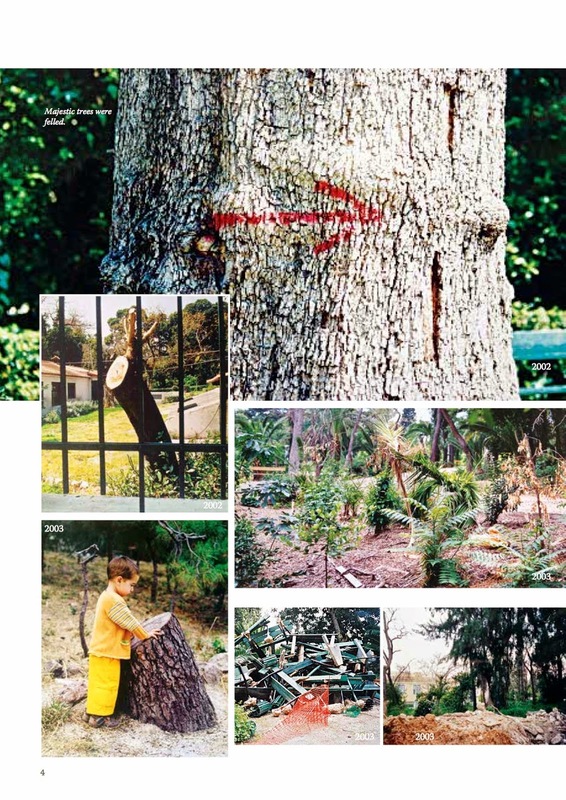 That fancy of NEON’ associate French landscape architect Louis Benech, would require cutting down monumental trees and, as agronomists explained to Hot Doc, even demolish some buildings in order to be realized. 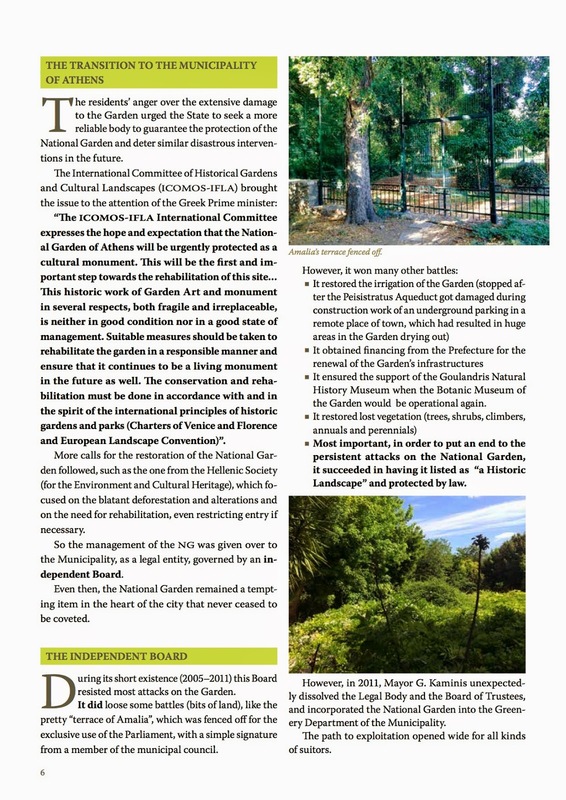 The Geotechnical Chamber of Greece, in its letter to Mayor George Kaminis dated January 3, 2014, points out the physical, planning and historical importance of the National Garden and emphasizes the importance of preserving its forestal character and highlighting its current landscape architecture. 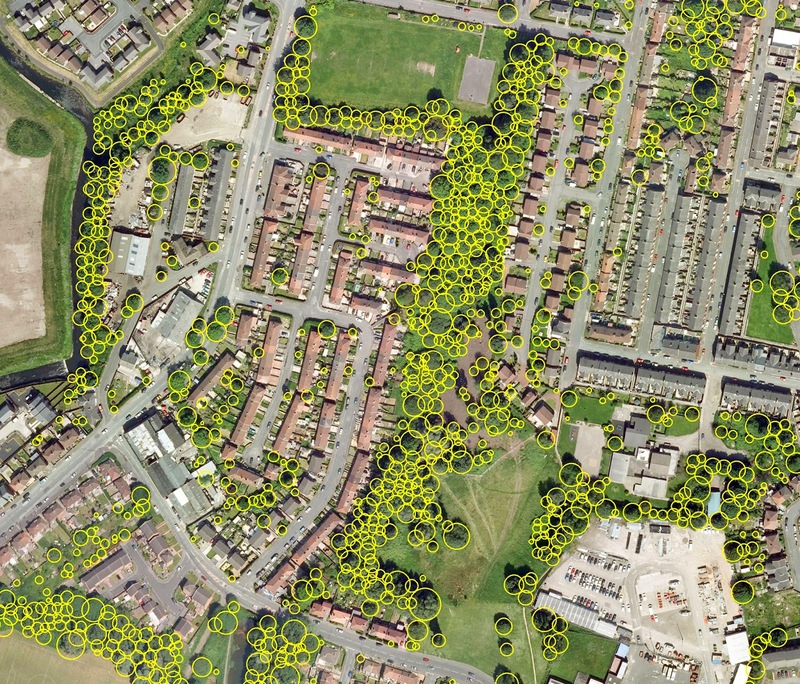 Experienced Landscape architects reported to Hot Doc that even the Garden’s public access is at stake, as no one can guarantee that once the exhibits are in place, entrance to children will still be allowed. In other words, children who until now have always been playing freely in the Garden, would have to be restrained and strictly supervised. Moreover, considering that the Garden closes at sunset to enable nature to rest, lighting modern art works is likely to disturb the ecological balance of the animals and the birds living in the Garden. Serious concern arises also with regard to the type of installations which will be brought in, given that the National Garden has been declared an archaeological site as it contains remnants of the ancient Lyceum of Apollo, the ancient aqueduct of Peisistratus and the aqueduct of Ymittos, the safety of which is bound to be jeopardized by the installations hosting the works of art and the vehicles which are already moving through the Garden’s pathways. 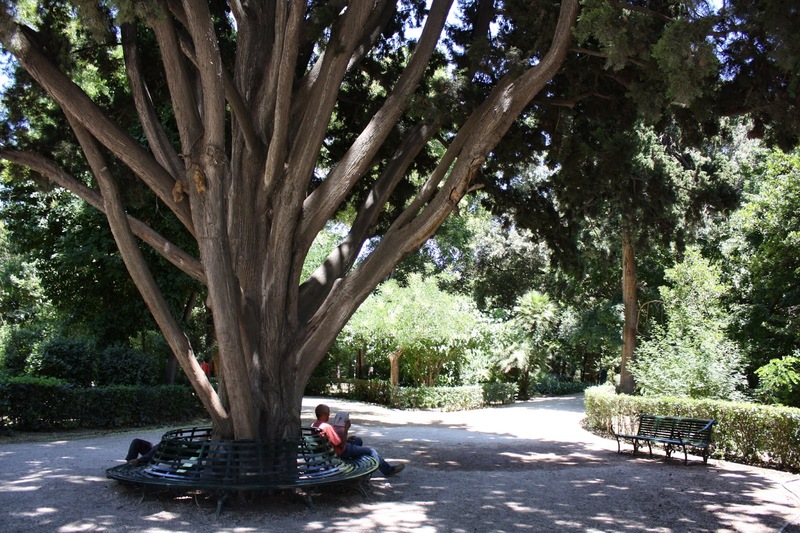 Meanwhile, the Society of the Friends of the National Garden and ten citizens have filed a complaint with the Council of the State against the municipality. 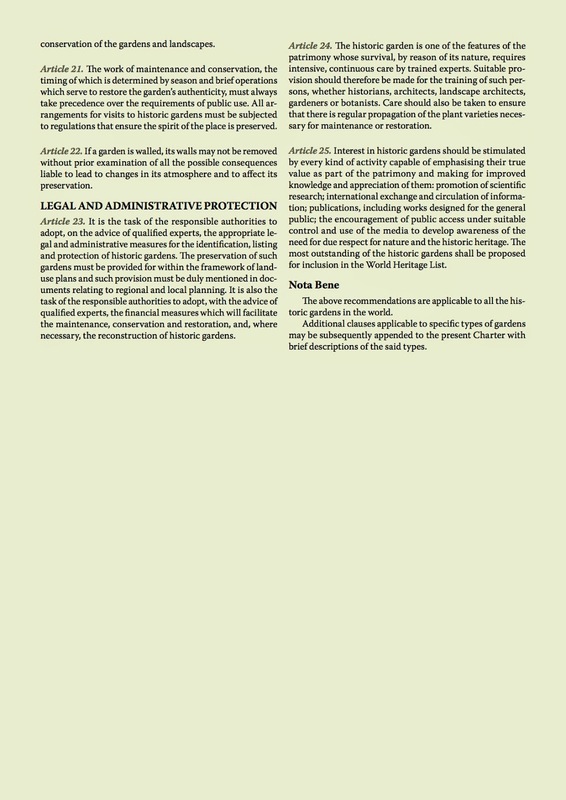 The Court’s decision is still pending; however, even in the event of the complaint being dismissed for technical or other reasons, the Municipality would still have to obtain authorizations from the Central Archaeological Council, the Council for Modern Monuments, the Forest Authority and the General Secretariat for Decentralized Regional Administration, before the works for supposedly “saving” the National Garden begin. 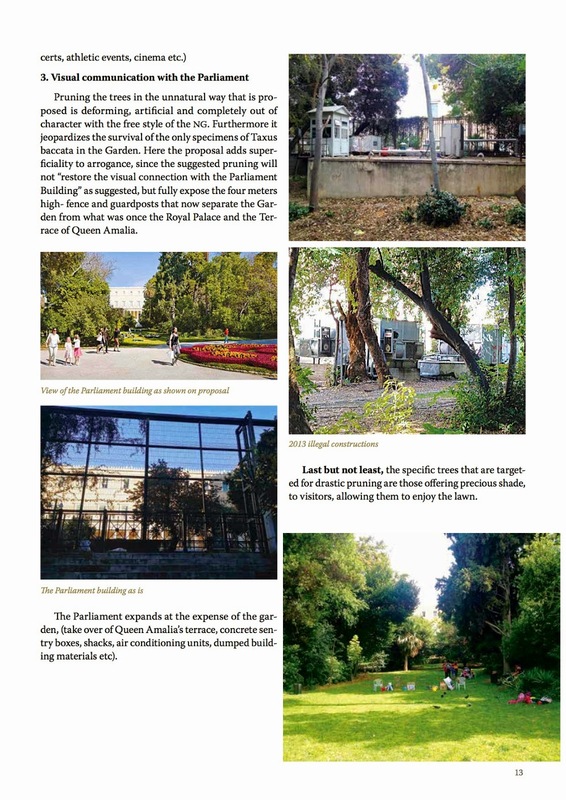 If all these authorities give their consent to the National Garden being transformed into an art gallery, then the best “plot of land” in Athens will officially acquire an owner. We have submitted all queries arising from our research to the Municipality of Athens and are still awaiting their reply. 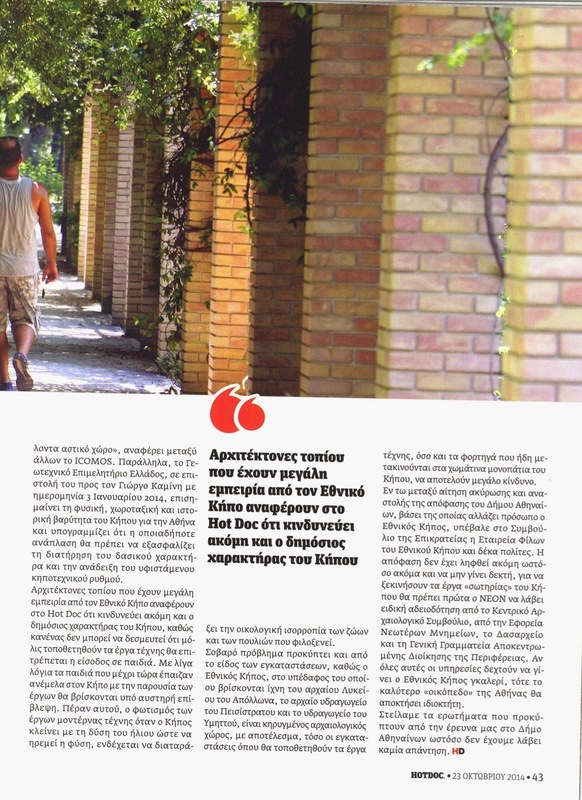 Below, translation of captions shown in the HOTDOC issue. 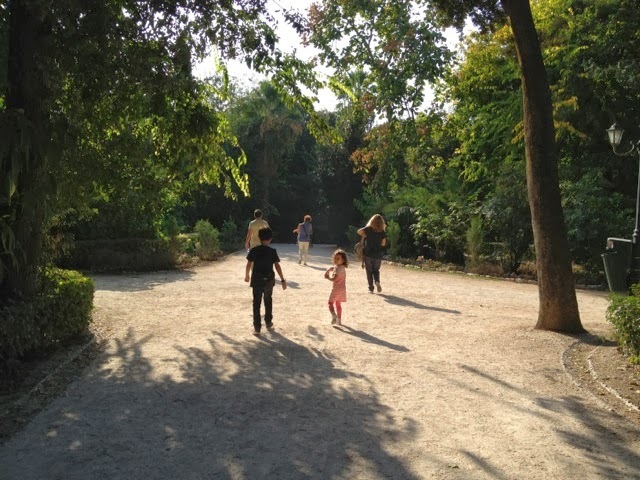 According to the report on Income and Expenses for year 2011, the Garden’s income amounts to 760,687 euros and its expenses to 278,920 euros. 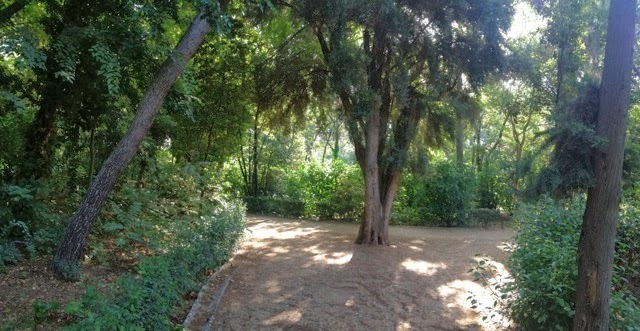 In March 2011, the Public Body succeeded in having the National Garden characterized as a historical site by the Ministry of Culture, effectively getting in the way of those planning to “interfere with the Garden”. Coincidentally or not, the Public Body was dissolved one year later by the City Council, without any justification. 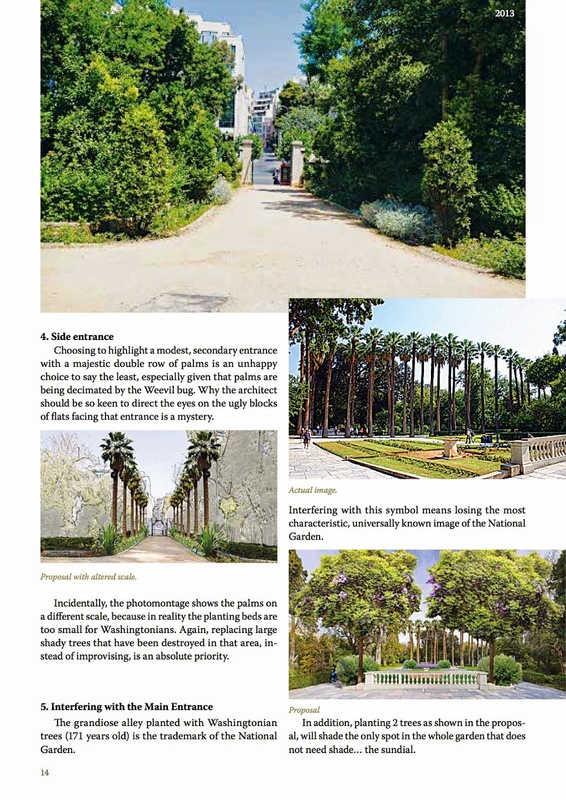 While the staff of the National Garden can be counted on the fingers of one hand, the Municipality of Athens received 2 million E from State funds in two years, for payroll, security, management and maintenance costs. 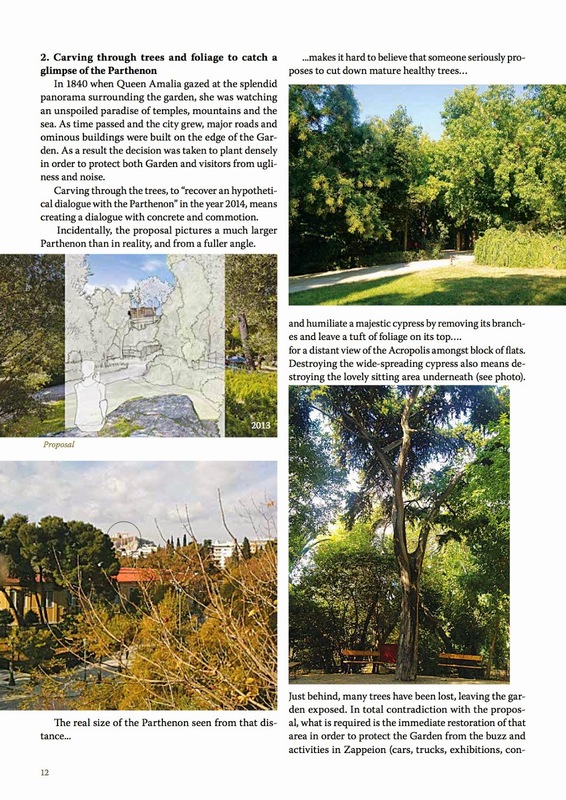 Members of the Hellenic Association of Landscape Contractors have characterized both the proposal and the overall project as “unrealistic and over-priced”. 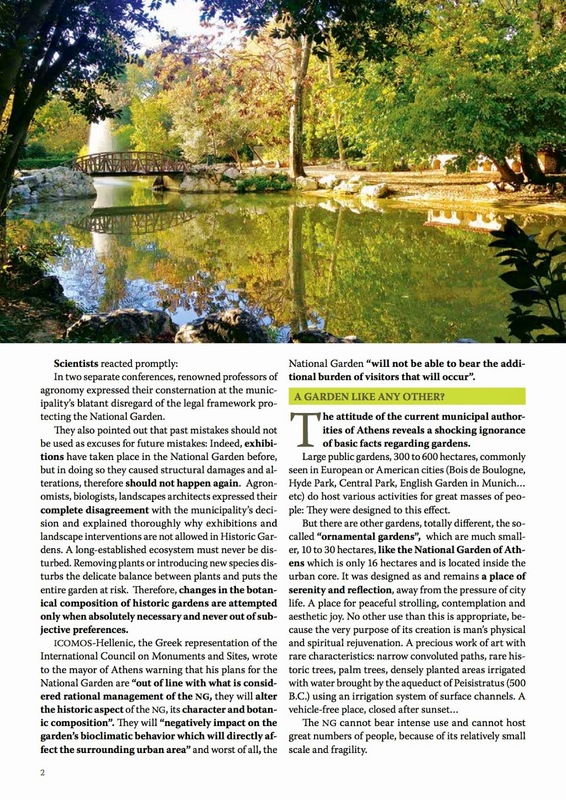 Landscape architects with considerable experience reported to Hot Doc that even the public character of the National Garden is at stake. 1. 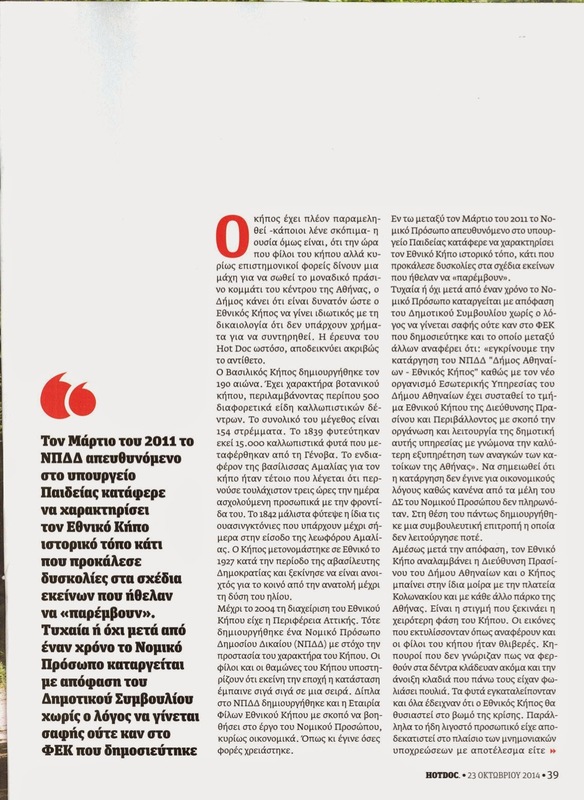 Ο Εθνικός Κήπος έχει χαρακτηριστεί από το 2011 «Ιστορικός Τόπος», κατά την έννοια της Χάρτας της Φλωρεντίας και συγχρόνως προστατεύεται με τη νομοθεσία της προστασίας Αρχαιοτήτων και Πολιτιστικής Κληρονομιάς (Aρθρο 24 του Συντάγματος). 2. Δυστυχώς, τα τελευταία χρόνια και μετά την κατάργηση του μέχρι τότε ειδικού φορέα διαχείρισης και την υπαγωγή του στον Δήμο Αθηναίων, η κατάσταση του Κήπου χειροτερεύει δραματικά και κινδυνεύει με αλλοίωση της ιστορικής του μορφής και φυσιογνωμίας. Μία κατάσταση που οδηγείται σε μη αναστρέψιμο σημείο. 3. Τα θεσμοθετημένα κονδύλια του υπουργείου Εσωτερικών, αποκλειστικά για τον Κήπο, προφανώς διοχετεύονται από τον δήμο σε άλλους σκοπούς. Hδη, από τους 8 κηπουρούς που απέμειναν, οι 6 βρίσκονται σε καθεστώς απόλυσης. 4. Προκειμένου ο Κήπος να διασωθεί και να αποκατασταθεί η φυσιογνωμία του, έχει άμεση ανάγκη μιας συνολικής κηποτεχνικής μελέτης με μακροπρόθεσμο ορίζοντα και με ορισμένες επείγουσες επεμβάσεις. 5. Μία τέτοια μελέτη πρέπει να γίνει αποκλειστικά από εξειδικευμένους επιστήμονες γεωπόνους και με τη βοήθεια διεθνών οργανισμών, με εμπειρία σε ιστορικούς κήπους και μνημεία. 6. 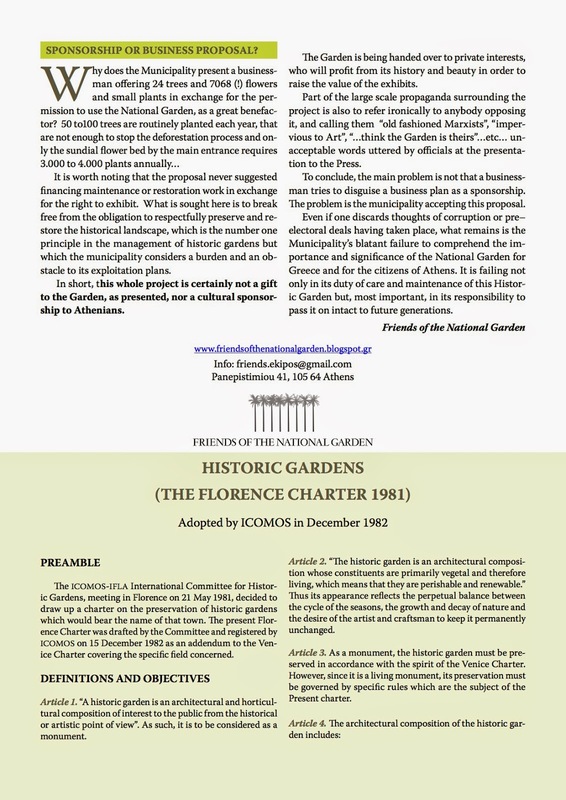 Ηδη, διεθνείς οργανισμοί όπως ο ICOMOS-IFLA, International Council on Monuments and Sites και International Federation Landscape Architects, αλλά και η Βαυαρική Διοίκηση Κρατικών Ανακτόρων Κήπων και Λιμνών, έχουν διατυπώσει τις βαθιές ανησυχίες τους αλλά και πρόθεση βοήθειας. 7. Εννοείται ότι οι αυθαίρετες και παράνομες κηποτεχνικές επεμβάσεις που προτείνει η ΝΕΟΝ, προκειμένου να παραδοθεί ο Κήπος σε ιδιώτη γκαλερίστα μοντέρνας τέχνης, θα αποτελούσαν τη χαριστική βολή του. Οι φίλοι του Κήπου καλούν τον κ. Δασκαλόπουλο σε συνεννόηση και συνεργασία, προκειμένου να διασωθεί ο Κήπος και να αποκατασταθεί, προς όφελος των Αθηναίων και της πολιτιστικής μας κληρονομιάς. Ο Κήπος πρέπει να αποδοθεί ανέπαφος και στις επόμενες γενιές, όταν θα αναζητούν ένα γαλήνιο μέρος για χαλάρωση και περισυλλογή, σε άμεση επαφή με τη φύση. Πριν την σύνταξη οποιουδήποτε λεπτομερούς Διαχειριστικού Σχεδίου για τον Εθνικό Κήπου ευχόμαστε κατά τα πρότυπα Διαχειριστικών Σχεδίων Βοτανικών Κήπων του εξωτερικού (σήμερα δεν υπάρχει κάτι το σχετικό και το πλήρες που να εφαρμόζεται και να ανταποκρίνεται στις ανάγκες) και το οποίο θα τηρείται αυστηρά στον χώρο και τον χρόνο, και πριν συνεχιστεί η φθορά του Κήπου που ήδη παρατηρείται σε όλα τα επίπεδα (δένδρα, αγάλματα, παρτέρια, στατικά στοιχεία, κ. ά….!!!). 2. Η αποτύπωση επιβάλλεται να γίνει με Γεωγραφικό Σύστημα Πληροφοριών (GIS) σε συνδυασμό με χρήση τεχνολογίας GPS (θέσεις αντικειμένων κατά Χ/Ψ). 3. Λεπτομερής αποτύπωση κάθε φυτικού είδους στον Κήπο και όλων των στατικών στοιχείων, μη φυτικών σχηματισμών, κατασκευών, συνθέσεων, κτιρίων, κλπ, με ακριβή γεωτοποθέτηση (positioning) επάνω σε λεπτομερές φωτογραμμετρικό μοντέλο (χάρτη) του ανάγλυφου εδάφους («δαπέδου») του Κήπου. 4. Απαιτείται να παραχθεί βάση δεδομένων (ένα χαρτογραφικό άλμπουμ) σε πινακίδες κλίμακας 1:200 η κάθε μία, με δυνατότητα παραγωγής μωσαϊκών για συνοπτικότερους χάρτες σε κλίμακες 1:500 και έως 1: 1000, κλπ. Αεροφωτογραφίσεις στο κοντινό υπέρυθρο φάσμα (NearInfrared CIR) και δημιουργία γεωμετρικά διορθωμένων ορθοφωτοχαρτών CIR και σε φυσικά χρώματα (True Color) αποτελούν ανεκτίμητα εργαλεία που θα βοηθούσαν στην υπόθεση «διαχείρισης» και παρακολούθησης της υγείας του Εθνικού Κήπου και κάθε αστικού πρασίνου. 5. Η χαρτογραφική αυτή βάση δεδομένων θα χρειαστεί να ενημερώνεται για κάθε μεταβολή στον χώρο και τον χρόνο από ανθρωπογενή και φυσικά αίτια. Θα αναπτυχθεί δηλαδή ένα ηλεκτρονικό Δενδρολόγιο και Θαμνολόγιο για τον Εθνικό Κήπο, βασικό εργαλείο για οποιοδήποτε εγχείρημα επέμβασης και αλλαγών στη σύνθεση και τον χαρακτήρα του Κήπου σε επίπεδο «φυτού» ή συστάδας φυτών ακόμη και παρτεριού (φυτοπροστασία, κλαδέματα, αραιώματα, στηρίξεις, αφαιρέσεις, συμπληρωματικές φυτεύσεις, κλπ)..
6. Σε ξεχωριστό χαρτογραφικό επίπεδο (overlay) και για κάθε πινακίδα ξεχωριστά (προτιμότερο σε κλίμακα 1:1000 και άνω) μπορούν να σημειώνονται «σύμβολα τυπολογίας του τοπίου στον Εθνικό Κήπο (Landscape Typogy) που θα προέρχονται από μελέτη Αξιολόγησης της Αισθητικής του Τοπίου (Landscape Evaluation Study). Οι συμβολισμοί θα γνωστοποιούν τα σημεία ενδιαφέροντος στον κήπο για τον επισκέπτη και τον περιπατητή π.χ. Πανοραμικές θέες, περιορισμένες θέες (vistas), αισθητικοί διάδρομοι (visual corridors), ξέφωτα και έγκλειστα (enclosures), τοπόσημα (Landmarks), κ.ά. 7. Για κάθε βοτανικό είδος στον κήπο (δένδρο, Θάμνο ή εδαφοκαλυπτική βλάστηση) δημιουργείται καρτέλα ηλεκτρονικού αρχείου με όλες τις απαραίτητες πληροφορίες όπως βοτανικό όνομα, ηλικία, προέλευση (φυτογεωγραφικά δεδομένα), σπανιότητα, βοτανικά χαρακτηριστικά (φυλλοβόλο, αείφυλλο, περίοδος ανθοφορίας, απαιτήσεις, διάμετρος κορμού, μέγιστο ύψος, βάθος ριζικού συστήματος, κ. ά. 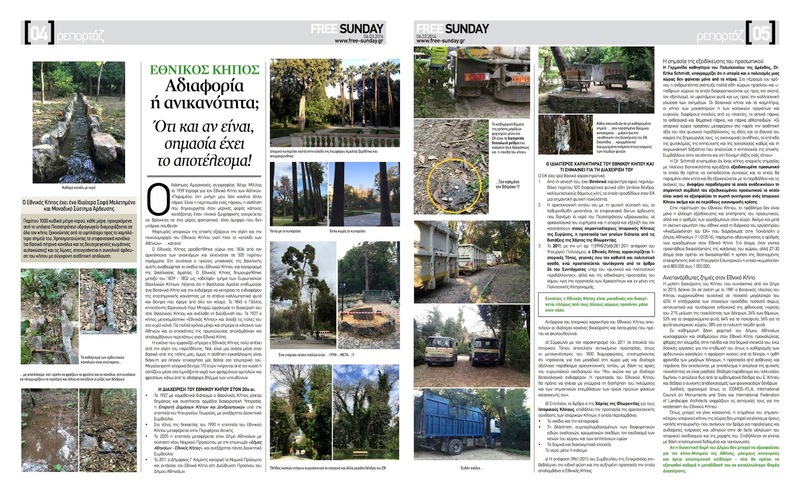 ), φυτοασθένειες και εχθροί, πανίδα που προσελκύει, περιβαλλοντική σημασία και αποτύπωμα CO2, κλπ. 8. Δημιουργία σημάνσεων στο πεδίο (εμφανείς ταμπέλες για κάθε είδος φυτού) που θα ταυτίζονται με το ηλεκτρονικό αρχείο για λόγους ενημέρωσης επισκεπτών, ασφάλειας, διευκόλυνσης συνεργείων συντήρησης, εφαρμογές λίπανσης εδάφους και φυτοπροστασίας. Όλα τα παραπάνω αποτελούν προαπαιτούμενα για μια σοβαρή Διαχείριση του Εθνικού Κήπου στο σύνολό του και για τον σχεδιασμό μιας οργανωμένης μεθοδολογίας τακτικών Επιθεωρήσεων του βαθμού «επικινδυνότητας» του φυτικού υλικού για πτώση, αλλά και διάγνωση ή πρόληψη φυτοασθενειών και προσβολών. Μέχρι σήμερα, τα παραπάνω δεν έχουν υλοποιηθεί ούτε «υπάρχουν» σε κανένα αρχείο και σε καμιά Υπηρεσία του Δήμου Αθηναίων ή της Κεντρικής Κυβέρνησης. Σε περιόδους κρίσης γνωρίζουμε ότι αδυνατούν να ανταποκριθούν οι Υπηρεσίες πλήρως στις υποχρεώσεις τους. Μερικές όμως περιπτώσεις όπου έχουμε να κάνουμε με ζωντανό οργανισμό και συνθήκες οικοσυστήματος, η οποιαδήποτε αδιαφορία και στενοκεφαλιά μπορούν να αποβούν καταστροφικές. Η βλάστηση δεν είναι οικοδομικό υλικό. Πρόκειται για οργανισμούς που πασχίζουν να επιβιώσουν σε εχθρικό αστικό περιβάλλον, περίεργες κλιματικές αλλαγές, κακή συντήρηση και περιορισμένες δυνατότητες σε πόρους και προσωπικό. Ο Εθνικός Κήπος είναι μία τέτοια περίπτωση. Με επικοινωνιακές «ασκήσεις» και «αφηγήματα» περί δήθεν αναπλάσεων, ανακαινίσεων και «ευχολόγια» περί το αστικό πράσινο και αναβάθμισης δημόσιων χώρων, δεν υπάρχει ελπίδα. Στη χώρα μας όλα δοξάζονται στις φάσεις «εξαγγελίας» και «παρουσίασης» αλλά χωλαίνουν στην πράξη η οποία απαιτεί κεφάλαια, πιστή εφαρμογή προδιαγραφών υλοποίησης, σοβαρότητα στη διαχείριση, τη συντήρηση και την ουσιαστική προστασία σε βάθος χρόνου. Οι ισχυρισμοί ότι οι Υπηρεσίες του Δήμου συντάσσουν Μελέτη Διαχείρισης για τον Κήπο σύμφωνα με την Υπ. 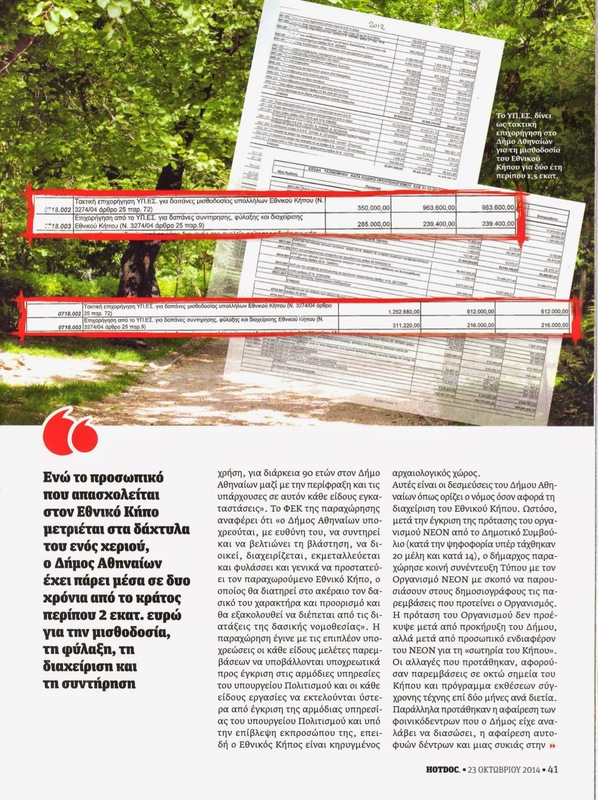 Απόφαση 125837/726/21.6.2013 γίνεται υπό το βάρος των γνωστών πιέσεων για παραχώρηση του Κήπου σε ιδιωτικό οργανισμό για διεξαγωγή «μπιενάλε σύγχρονης τέχνης» αφού θα συνοδεύονταν και από κηποτεχνικές παρεμβάσεις 8 σημείων («γεωτεχνικά προκλητικές, αυθαίρετες, επικίνδυνες και περιττές για τον Κήπο» κατά την επικρατούσα άποψη του γεωπονικού επιστημονικού κόσμου και όχι μόνο). 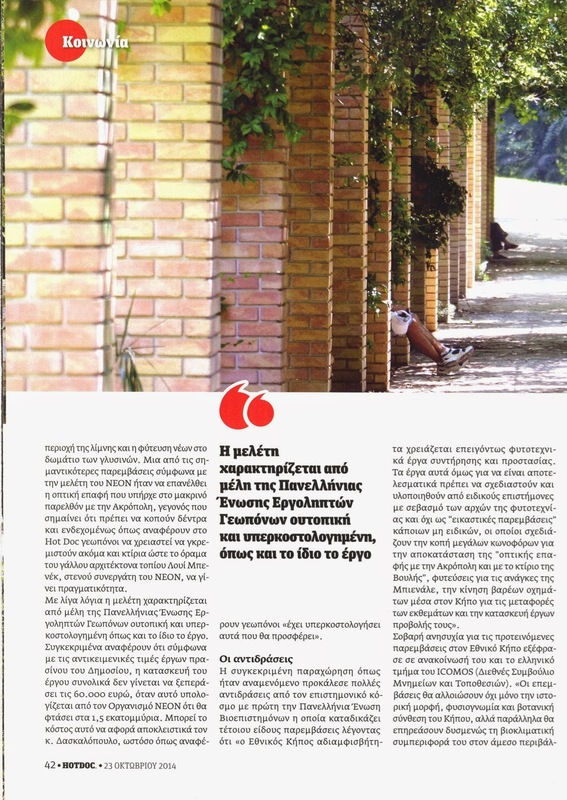 Όλα αυτά, στο πλαίσιο μιας «μεγαλεπήβολης σχεδιαστικής προχειρότητας» ενός επώνυμου ουρανοκατέβατου Γάλλου «μεγαλοκηπουρού» στην οποία δόθηκε τεράστια & επαναληπτική δημοσιότητα προεκλογικά, υπερπολλαπλάσια των «σοβαρών» απόψεων της εγχώριας επιστημονικής κοινότητας και των Οργανώσεων Προστασίας και Φιλίας για τον Κήπο. Η πρόταση του Γάλλου κηπουρού και η «επιχειρηματολογία» που ανέπτυσσαν ο ίδιος και οι εδώ υποστηρικτές του κρίθηκαν «αισθητικά, βοτανικά και περιβαλλοντικά ασυμβίβαστες» με τον ιστορικό, βοτανικό και περιβαλλοντικό χαρακτήρα του Εθνικού Κήπου… Η πείρα διδάσκει ότι η μετάκληση ακριβοπληρωμένων ξένων «ειδικών» για να εξυπηρετηθούν σκοπιμότητες (ενίοτε πολιτικές), δεν είναι πάντοτε η ενδεδειγμένη για τοπικές υποθέσεις που οι ίδιοι δεν είναι σε θέση να τις γνωρίζουν σε βάθος, τόσο όσο τις γνωρίζει και βιώνει η «συνεχώς παρούσα» εγχώρια επιστημονική κοινότητα, εκτός του γεγονότος ότι όλα συμβαίνουν για λόγους «εντυπωσιασμού» και της «παραδοσιακής δυσκολίας» να αναγνωριστεί η εξ’ ίσου υψηλή και πολλές φορές ανώτερη επάρκεια των ελλήνων επιστημόνων και ειδικών (οι πιο αναγνωρισμένοι από τούτη την πατρίδα, ζουν εκτός συνόρων….). Από την άλλη πλευρά, στη χώρα μας βιώνουμε συνθήκες προκλητικής «αδιαφορίας και ανευθυνότητας» μιας πλήρως αποσαθρωμένης πολιτείας, ενός στενόμυαλου μηχανισμού μιας πολύ χειρότερης αντίληψης περί την «αντικειμενική επιστημονική προσέγγιση» των θεμάτων, εγκλωβισμένης σε «αναχρονιστική» δημοσιοϋπαλληλική νοοτροπία «νοσηρής απραξίας» που θέτει σε κίνδυνο πολλές περισσότερες αξίες από τον Εθνικό Κήπο. Όλα γίνονται με περίτρανη προχειρότητα, οι Υπηρεσίες πρασίνου βρίσκονται σε λήθαργο, υπολειτουργούν ή μετατρέπονται σε συνεργεία καθαρισμού, διαχειριστικές μελέτες πρασίνου συντάσσονται από ανειδίκευτους και αδαπάνως, ενδοϋπηρεσιακά και στο πόδι (όποτε αυτές συντάσσονται), έτσι για να ισχυρίζονται ότι «μελέτες έχουμε κάνει»…. Τις Μελέτες που υποβάλλονται π.χ. στον Δήμο Αθηναίων, ή συντάσσονται από τις υπηρεσίες του Δήμου Αθηναίων (π.χ. Διαχειριστικές, χωρίς αναθέσεις με διαγωνισμό) κανένας δεν τις δημοσιοποιεί προς ανοικτή διαβούλευση, δημιουργώντας υποψίες ότι περιεχόμενο και συμπεράσματα διευθετούνται στο παρασκήνιο (π.χ. επίβλεψη σύνταξης, εξέταση πληρότητας και εγκρίσεις των μελετών), κανένας δεν τις βλέπει και το χειρότερο κανένας δεν τις εφαρμόζει, απλά γιατί πρόκειται για τραγικά απαράδεκτα κείμενα που δεν αντέχουν το φως του ήλιου, ανεφάρμοστα και κατά παράβαση των όποιων προδιαγραφών και του ισχύοντος θεσμικού πλαισίου. Τέτοιες πρακτικές τα τελευταία χρόνια αποτελούν καθημερινό φαινόμενο στους ΟΤΑ, στην Κεντρική Κυβέρνηση και τους κρατικούς Οργανισμούς, λόγω του γεγονότος ότι οι προδιαγραφές, οι μεθοδολογίες, τα αποτελέσματα των όποιων μελετών και οι ίδιοι οι μελετητές, επιβάλλεται να βρίσκονται «υπό τον απόλυτο έλεγχο, μην τους συμβεί κανένα ατύχημα και διαρρεύσει η αλήθεια» και ανατραπούν σχεδιασμοί και σκοπιμότητες. Ο Εθνικός μας Κήπος κατά την Φιλοσοφία του Δήμου Αθηναίων και των Υπηρεσιών του, «είναιμια χαρά και το πρόβλημα του είναι ότι έχει έλλειψη από κόσμο…..». Η αντίληψη αυτή πιστοποιεί για μια ακόμη φορά και τη σύγχυση που επικρατεί ως προς τον χαρακτήρα και τον ρόλο του Εθνικού Κήπου… Ο Εθνικός Κήπος ανάλογα με τις συγκυρίες και τις «ορέξεις» των φορέων που καλούνται να τον εποπτεύουν, να τον συντηρούν και να τον προστατεύουν (ΥΠΕΣ, Δ. Αθηναίων, ΥΠΠΟ, Δασαρχείο, κλπ) άλλοτε είναι «Βοτανικός Κήπος», άλλοτε «Εκθεσιακός χώρος», άλλοτε «Δημοτικό Πάρκο», άλλοτε «Δασική έκταση…..!!! !», άλλοτε «Νεώτερο Μνημείο» και άλλοτε λίγο από όλα. Δυστυχώς κανείς τους δεν έχει αντιληφθεί ή αδυνατεί να το πράξει και να δεχθεί ότι ο Εθνικός Κήπος δεν είναι «πλατεία». Οποιαδήποτε παρέμβαση στον χώρο, προϋποθέτει λεπτομερή καταγραφή και ανάλυση των περιβαλλοντικών και των κοινωνικοοικονομικών επιπτώσεων που θα προκληθούν (πρωτογενώς και δευτερογενώς)…. και της τεράστιας δαπάνης που θα απαιτήσουν τα επανορθωτικά μέτρα και οι επεμβάσεις αποκατάστασης. Για όσους έχουν επαρκή επιστημονική αντίληψη του χώρου και γνωρίζουν το πολύτιμο περιεχόμενο του Εθνικού Κήπου, την σημαντικότητά του και τα συστατικά του (βοτανικά, ιστορικά, αισθητικά, μικροκλιματικά, κλπ), στην ουσία πρόκειται για Εθνικό Βοτανικό Κήπο (όπως τα γνωστά National Arboretums ή National Gardens), αλλά λόγω της πλούσιας βιοποικιλότητας που τον χαρακτηρίζει, πέραν του πλούσιου και ποικίλου δενδρώδους πληθυσμού, θα λέγαμε ότι ο χαρακτήρας του «Εθνικού Κήπου» (National Gardens), διαχρονικά μεταπλάστηκε σε «αισθητικό αστικό δάσος ιδιαίτερης βοτανικής σύνθεσης», τίτλος που επίσης του ταιριάζει απόλυτα και τον διαφοροποιεί από το υπόλοιπο αστικό πράσινο σε εθνική κλίμακα !!! Άρα δεν πρόκειται για έναν κοινό κήπο ή πάρκο, δασύλλιο, σύνηθες πευκοδάσος ή κάτι παρεμφερές «μεσογειακού χαρακτήρα»..!!!. 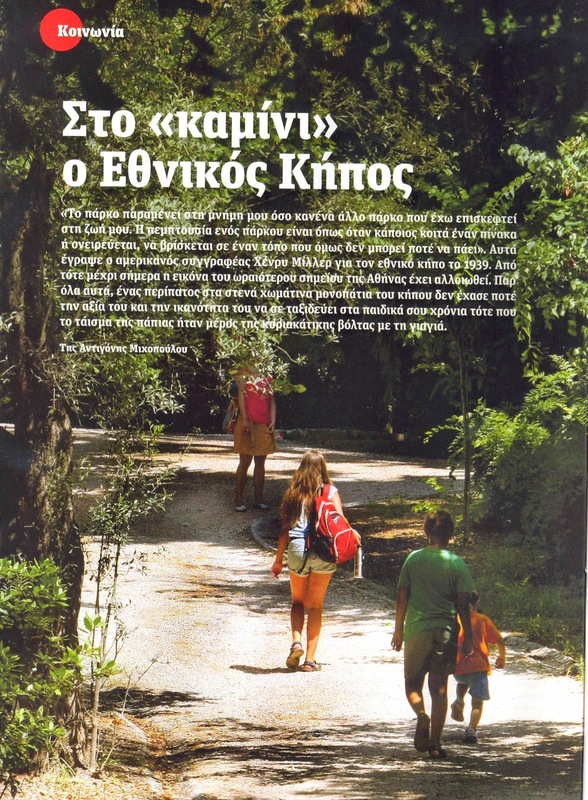 Η «έννοια» του αισθητικού δάσους (ημιφυσικού/τεχνητού) βρίσκει έδαφος στον Εθνικό Κήπο, αν κρίνει κανείς από τη σύνθεση των συστάδων, τις συμβιώσεις που έχουν αναπτυχθεί και διατηρούνται, τους ορόφους και υπορόφους, του βαθμού συγκόμωσης, τους εποικισμούς από χλωρίδα και πανίδα (λειτουργώντας ως βιολογικό καταφύγιο στον αστικό ιστό), κλπ. Θα εστιάζαμε λοιπόν τελικά στον χαρακτήρα Εθνικού Κήπου με χαρακτήρα Arboretum = ήτοι βοτανική συλλογή διαφορετικών ειδών δένδρων και θάμνων από ολόκληρο τον κόσμο. Βέβαια οι επιστήμες της οικολογίας και της βοτανικής μαζί και οι διαχρονικές μεταβολές που έχει υποστεί ο Κήπος (όσες έχουν παρατηρηθεί και καταγραφεί) δεν μας έχουν πείσει για το εάν, πόσο και πως εξελίσσεται το θεωρητικά κλειστό αστικό οικοσύστημα που ονομάζουμε Εθνικό Κήπο, (αν και η επικοινωνία του με το υπόλοιπο αστικό και περιαστικό πράσινο είναι υπαρκτή και διαπιστωμένη). Επομένως πολύ παρακινδυνευμένη θα ήταν η διαπίστωση ότι ο Κήπος εξελίσσεται προς μια κλιμακική κατάσταση σταθερότητας (climax), εξελικτικό στάδιο που παρατηρείται κυρίως στα δασικά οικοσυστήματα που επιβιώνουν με την ελάχιστη ανθρώπινη παρέμβαση. Ο Εθνικός Κήπος δεν μπορεί και δεν θ’ αντέξει εάν συνεχίσει έτσι χωρίς σοβαρό διαχειριστικό σχέδιο που θα εφαρμόζεται ευλαβικά. Ο Δήμος Αθηναίων αντί να ασχολείται με αλλότρια και να μεταχειρίζεται τον Εθνικό Κήπο ως «προϊόν», «ιδιόκτητο εκθεσιακό χώρο» ή «αξιοθέατο», πρέπει να αντιληφθεί ότι εάν δεν κινητοποιηθεί και δεν σοβαρευτεί θα γίνουμε μάρτυρες πολλών δυσάρεστων εξελίξεων με απώλειες φυτικού υλικού, φθορές στατικών στοιχείων στον κήπο μεγάλης ιστορικής αξίας και καλλιτεχνικού ενδιαφέροντος, ανεπανόρθωτων φυτοπαθολογικών περιστατικών και το χειρότερο, απρόσμενων ατυχημάτων με πτώσεις δένδρων και κλάδων με θύματα ανυποψίαστους επισκέπτες και περαστικούς. Ημοναδικότητα του Εθνικού μας Κήπου έγκειται στην πυκνή του βλάστηση και ιδιαίτερα στα μεσαίου ύψους φυτά που κλείνουν το οπτικό πεδίο, δημιουργώντας την εντύπωση ότι ο κήπος είναι μεγαλύτερος απ’ ό,τι πραγματικά είναι. Αλλά οφείλεται και στη γαλήνη που αποπέμπει. Ο κήπος κληροδοτήθηκε, έτσι όπως είναι, σε μας τους πολίτες της Αθήνας. Και έτσι πρέπει να μείνει. Μπορεί να χάθηκε ένα τμήμα του από την επέκταση της Προεδρικής Φρουράς, μπορεί να αλλοιώθηκε ένα άλλο από τα μηχανήματα της Βουλής, αλλά κάπου πρέπει να πούμε φτάνει, δεν πάει άλλο. Δεν χρειαζόμαστε γλυπτά για να ανακαλύψουμε, όπως ελέχθη, τον κήπο, ούτε βέβαια θέλουμε βάσεις για τη στήριξή τους, ούτε, όπως στην έκθεση της Γενναδείου, σεκιουριτάδες να περιφέρονται και τραπέζια για διανομή φυλλαδίων και τοποθέτηση εκθεμάτων. Ούτε και ηχητικές εγκαταστάσεις, τα πουλιά αρκούν. Μόνο συνεχή και επιστημονικά άρτια συντήρηση χρειάζεται. Και να παραμείνουν αναλλοίωτα η μορφή και το απαραβίαστο του κήπου. Και κάτι ακόμα. Aμα γίνει η αρχή με την έκθεση γλυπτών, κανείς δεν μπορεί να προβλέψει τι άλλες δράσεις και παρεμβάσεις θα προταθούν στο μέλλον. Και τι επιπτώσεις στον κήπο θα έχουν. Σιγά σιγά ανοίγει η όρεξη ή, με άλλα λόγια, μιας παρέμβασης μύριες όσες έπονται. Αφήστε τον κήπο στην ηρεμία του. Υπάρχουν τόσοι άλλοι δημόσιοι χώροι όπου γλυπτά και εκδηλώσεις θα ήταν καλοδεχούμενα.